Steel Rolex Oyster Perpetual Submariner Date Original 50th Anniversary 16610LV. Automatic chronometer movement. Water resistant to 300 metres. 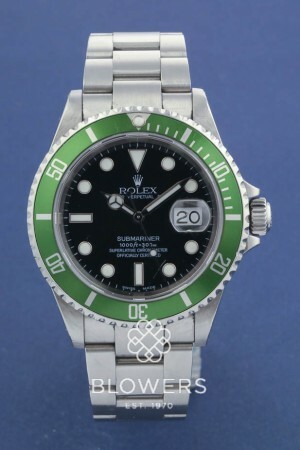 Black maxi dial with green uni-directional bezel "FLAT 4". Steel Oyster lock bracelet. Box and papers dated February 2004. Rolex Service September 2018. SKU: 3108862. Categories: Gents, Rolex, Submariner.